My husband and I got a nice peeler tool as a wedding gift so I was excited to break this new kitchen tool out and see how it worked on a squash. I have to admit, I had way too much fun with this peeler tool. So much that my husband decided he wanted to peel the squash and take over. He wanted in on the fun! Once the squash was peeled we cut it up into cubes. Towards the middle of the butternut squash there were seeds so we washed those out. While my husband was cutting up the squash. I heated 2 TBSPs of coconut oil in a pan. If you’ve used coconut oil before, you may know that it gets solid. So I scooped it out in solid form and heated it up to make it liquid. Doing this smells so good, too. It is a scent that makes me happy. Once the oil was melted and the squash was cut, I put the squash into a medium sized bowl and poured the coconut oil on top. I tossed the butternut squash around so the coconut oil was evenly coated throughout. Once that was done I lined a cookie sheet with foil and pour the butternut squash cubes onto it. Then I sprinkled the butternut squash cubes with cinnamon. I ended up cooking the butternut squash for about 45 minutes. I don’t think it should take this long normally so my advice would be to cook it for 20 minutes and then keep checking it every 5-10 minutes until its cooked to your liking. This butternut squash recipe is on the sweeter side so they are great if you find yourself having a sweets craving but want to eat clean. This recipe is also paleo and Whole30 approved for those of you who are on a challenge right now. Enjoy! 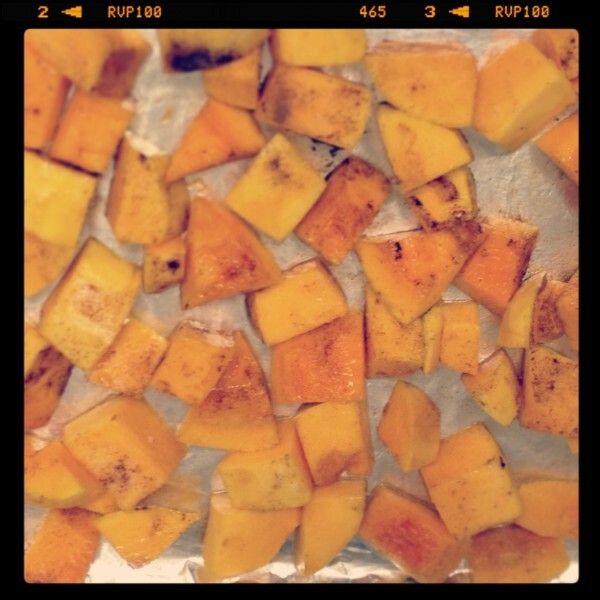 I love roasted butternut squash and my favorite seasoning for it is cinnamon, nutmeg, cloves! Oooo, cloves and nutmeg would taste great on them. Thanks for the tips! Got my new CSA box this morning. So excited to cook up new veggies! Put in microwave for 3-4 minutes before you get started. This will make the skin a lot softer and makes peeling so much easier. What did you set your oven temperature?